Try the newly-released version of Rattle, the open source R package for data mining, and enjoy accessing a huge array of data mining algorithms through a convenient interface. By Graham Williams, (Togaware), Sept 2014. The latest release of the Rattle package for Data Mining in R is now available. R continues to be the platform of choice for the data scientist. 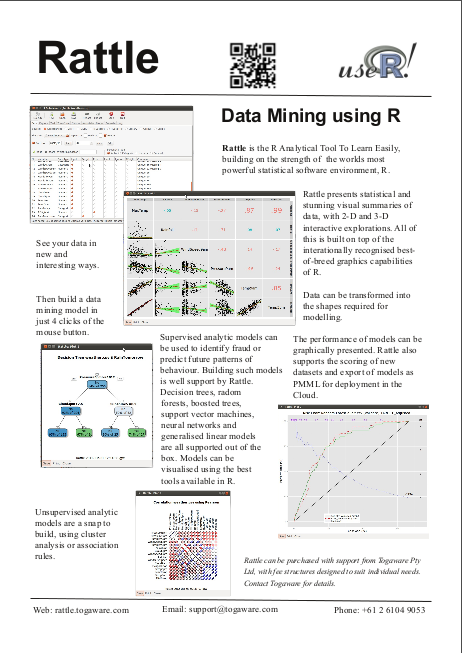 Rattle is a freely available and open source graphical user interface for Data Mining using R, wrapping up the use of over 100 R packages that together provide the most popular algorithms for the Data Scientist. Rattle is used widely by Data Scientists across industry and by many independent consultants. It is also used for teaching the concepts of Machine Learning and Data Mining, and as a pathway into the full power of R for the Data Scientist - an important feature of Rattle is that all functionality accessed via the graphical user interface is captured as a structured R script that can be run independently of Rattle to repeat every step performed by Rattle. In addition to being a useful tool for learning R it transparently supports repeatability of all activity in scripts that can extended or automatically be run at a later time. The related popular text book Data Mining using R is available from Amazon. Also note that feature requests and bug fixes are now captured and voted on and resolved using the new Connect-R service where users are encouraged to nominate features they would like to see in Rattle. Such requests are then put up to the community for implementation.